1. Do not over tighten. I looked at his old gasket he had brought in and noticed that it had split at the screw holes and had been crushed and distorted. When one tighens the fastener against a gasket the objective is to "tighten" the joint to prevent leakage. 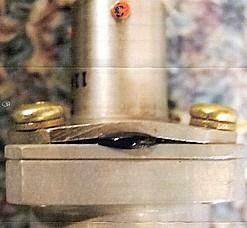 This tightening occurs because the gasket material and joint faying surfaces pushes back against the fastener. Rubber gaskets behave differently, rubber does not compress, rather it moves away from stress; it changes shape (extrudes) into any free surface. Extra tighening does not tighen. It just increasingly distorts the gasket. Technically, rubber has a poisson's (pronounced "pwa-son") ratio close to the upper limit of 0.5 meaning that it is incompressible. 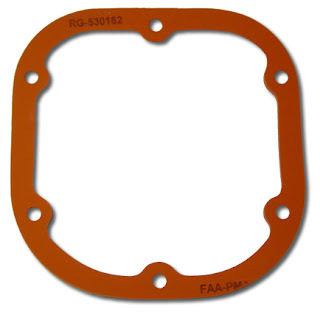 Now compare this with the traditional cork gasket used on Lycoming rocker cover gaskets; cork has a poisson's ratio close to 0.0. This is why it makes a good cork - when you push on it, it doesn't bulge and can still be pushed back into the wine bottle. Rubber bottle corks are always tapered to allow for bulging. Cork take-as-set and crush over time which loosens the joint causing leakage. Go back and re-establish proper torque on a cork gasket because they take-a-set and a little extra tightening generally doesn't harm them; and, it is ok to re-establish proper torque on a rubber style gasket but beware that extra tightening doesn't tighten, it distorts. What about those hybrid gaskets like Continental's rocker cover gaskets? Follow rule #1 Do not over tighten.